If you work in a nonprofit, you’re probably knee-deep in crafting your donation letters. But the question is: how do you get your donation letter to stand out from the crowd? Truth be told, everything from your intended audience to your donation letter format matters if you want to attract donors. So, in this post, I’m breaking down how to write a donation letter. 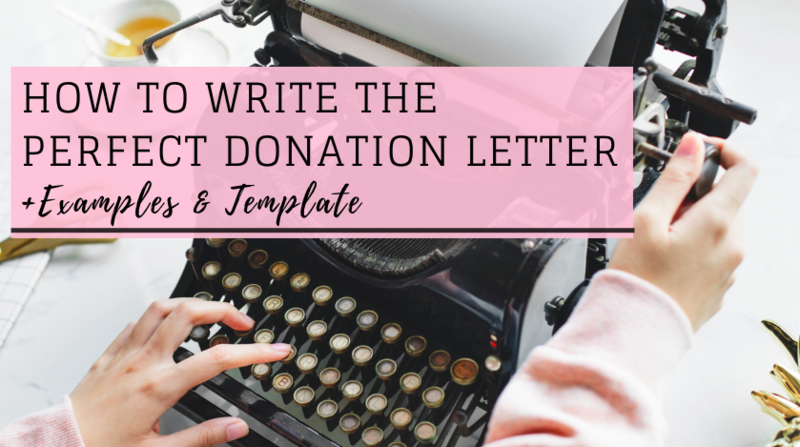 I’ll also highlight two stellar nonprofit donation letters, and provide you with a template and some best practices to help you along your letter-writing journey. Donation letters, also known as appeals, are a tool nonprofits use to entice prospective supporters to donate. Most of the time, they include a written ask for either financial support or an in-kind gift. Although they’re fairly short and don’t necessarily have the depth of your typical pamphlet or other marketing materials, donation letters address the specific need a nonprofit is trying to meet. Many also include basic information about overall organizational impact and acknowledge a donor’s past philanthropic efforts. In a nutshell, donation letters are meant to inform your donors about your efforts and ultimately encourage donations. Fundraising letters generally fall into two separate categories: individual and corporate appeals. Wondering what the difference is — and why it matters? Read on! You know those letters you receive in the mail from March of Dimes, the ASPCA, and the World Wildlife Fund? Those are individual appeals! As the name suggests, individual appeals are donation letters directed to individual donors. This category also includes couples and families who give collectively. Individual appeals are personalized to a donor or family and usually request a one-time or recurring gift. Appeals can be geared for everyday donations, or for a specific campaign, depending on your nonprofit’s needs. Nonprofits send corporate appeals to local, national, and international small, medium, and large businesses. Although the audience is different, corporate donation letters are structured similarly to individual appeals. The difference between them lies in what it is you’re asking for. 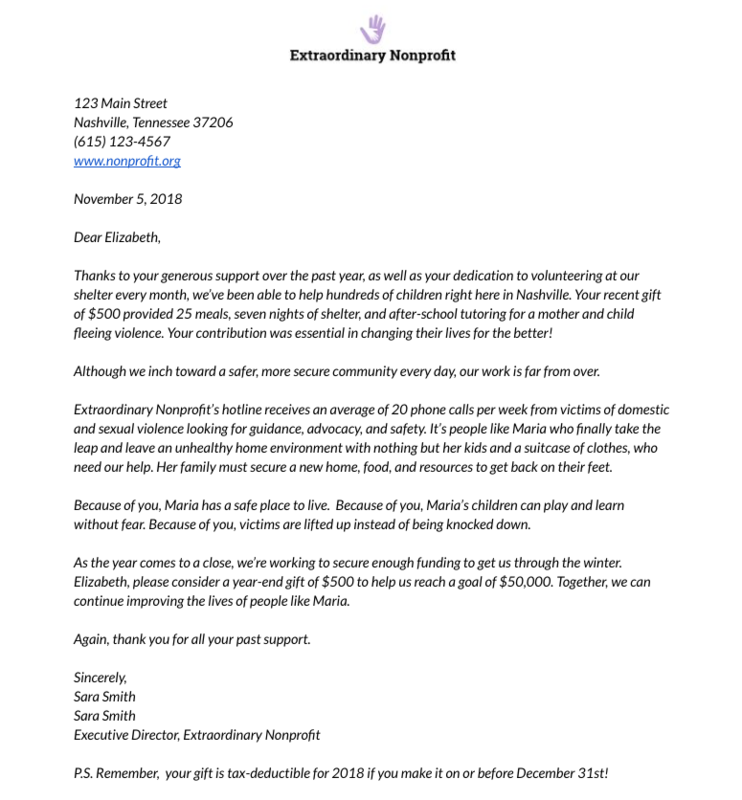 Many nonprofits write corporate donation letters to request in-kind donations (meals for an upcoming charity event, gift certificates for a raffle), collect employee gift matches, or ask for a sponsorship. For example, if you want to supply pizza for a volunteer thank-you party and are looking for a local pizza parlor to provide the pizza in-kind, you’d write a corporate appeal. This type of donation letter often focuses more heavily on the benefit to the organization donating and how it helps their business goals. For the example above, you could say that your volunteers will now recognize the pizza parlour who donated, and will be more likely to eat there in the future. Whether you work at a small, hyper-local nonprofit or an international organization, it’s important to create fundraising appeals for each fundraising campaign. However, there are a few very important questions you need to think through before you begin distributing appeals. How many letters should you send? It’s up to you to decide how many letters are right for you. If you don’t know where to start, aim for around three fundraising letters (or emails) for campaigns up to thirty days. Naturally, longer campaigns demand more letter touchpoints. How often should you send them? Send the correspondence either right before kickoff or by the first day of the campaign. Follow up with another letter halfway through the campaign, and then again during the last days/week. Speed up or slow down your frequency depending on past donor trends. For example, if the vast majority of your donors give during the first few days of the campaign when momentum is high, cluster your correspondence accordingly. How should you distribute them? The advice throughout this post works equally well for emails or letters. Depending on your target audience, you may choose to send one or the other, or a mixture of both. When is the best time? Understanding (and tracking) your donor’s behavior is vital if you want to know the ideal time to send out communications. Hint: this is where donor and membership management software comes in handy! If you’re sending appeals online through email or on social media, use your data analytics (Google, Facebook) to track when people open your emails and engage with you online. If you’re sending appeals through direct mail, ensure each piece is postmarked and mailed before your fundraising deadlines. At the end of the day, you need to consider how long your campaign lasts, the response rate of your typical donor, and your urgency when you craft a donation letter plan. Header: Include your nonprofit’s name and branded logo if you have one. Nonprofit Contact Information: Include your physical address and phone number. Listing a contact person, nonprofit website, and email address, although helpful, is optional. Date: Include the date when you plan to mail/email the letter. Acknowledgement of Donor Relationship: At the beginning of your letter, acknowledge your relationship with the donor. Understandably, this is difficult if you’re working with a donor base of hundreds, if not thousands. If you don’t have the time or capacity to personalize each letter, segment your donors based on how you interact with them: lapsed donor, current donor, volunteer, board member, etc. A simple, “You’ve been a big part of our organization’s fabric over the years. We can’t thank you enough for your support as a donor, and a frequent volunteer” is a solid start to a giving donation letter because it lets your donor know that you appreciate their past commitments. Nonprofit Story: Your story is the hook that connects your reader to your mission on an emotional level. The Need: Explain the need your nonprofit addresses. Feel free to throw a statistic out there, but put your main focus on who or what is in need of help. Tell the story of a family sheltered from winter winds at your soup kitchen, or the animal in need of a forever home. The Solution: After writing about the need, outline the solution. What is the ideal result? Describe what it looks like when your nonprofit succeeds. The Hero: Every story needs a hero: someone who makes the change happen. Yes, your nonprofit is doing much of the work, but it’s all because of your donor’s support. Make your donor the hero of the story every time. 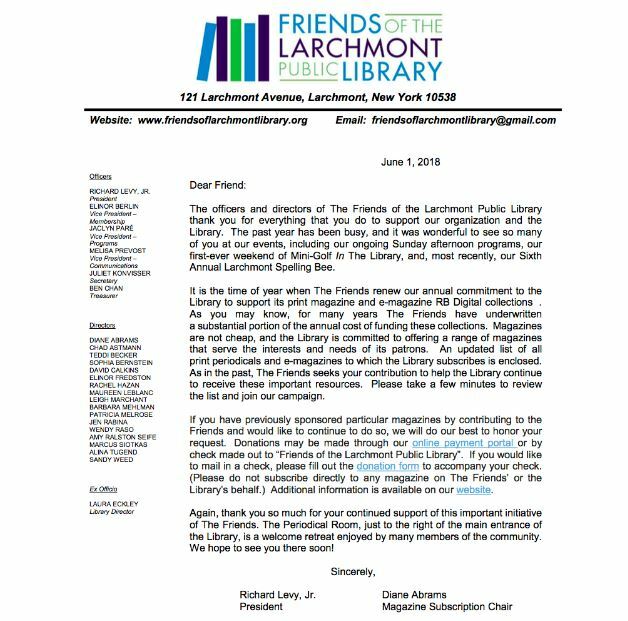 Call-to-Action: You’re sending this letter to bring in donations, so reinforce that message! At the end of your donation letter, write a clear, direct call-to-action, outlining exactly what you want from your reader. Don’t assume they know what you’re looking for. Thank and Sign: Finish your letter by thanking your recipient for considering a gift, and signing it. Ignore the temptation to sign from your organization. Instead, choose an employee, board member, or key volunteer to represent the collective whole. This helps promote the ideal “human-to-human” element you’re aiming for, and reinforces the personal connection between you and your donor. Now it's time to start writing your own donation letter. To get you started, here's a template using the framework I discussed above as well as an example of a letter that follows it. If you'd like this template as a Google Doc so that you can donate it yourself, you can access that here. If you want a little more inspiration, here are two letters I’ve received lately that inspired me to donate. 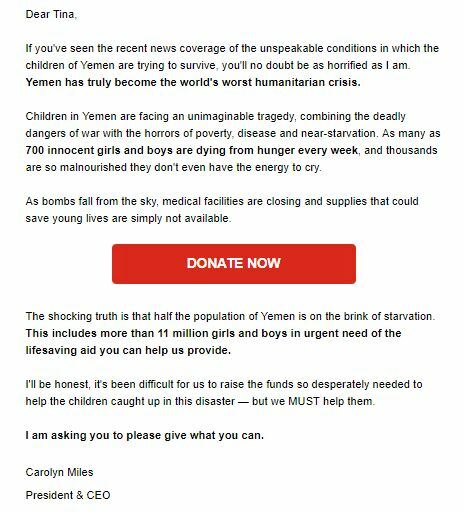 This email is stellar because it follows a traditional donation letter format, but appeals to someone reading an email (as opposed to a physical letter). It begins with an informal yet personal salutation, speaks to a timely world issue (bonus! ), mentions their need, the solution, and concrete ways the organization is helping, a direct call-to-action, and a personal plea. Finally, it’s signed by a person. It’s easily absorbable, personal, and timely. Here are three more best practices to keep in mind as you begin crafting your donation letter. Be Conversational & Ignore Jargon: You understand your internal lingo, but your donor may not be as comfortable with nonprofit jargon. So toss those “collective actions,” “synergizing,” and “alignments” aside, and opt for something more human and personal. Write your letter as though you’re speaking to someone face-to-face. Track Your Data: Record response rates from your donors. This can help you improve your letters and timing for campaigns down the road. Add Extras: Set your nonprofit up for success later on through fundraising “extras.” These include asking your donor to consider a recurring or monthly gift or inviting them to participate in the campaign by sharing or fundraising themselves. And do you know the best part of the letter writing process? 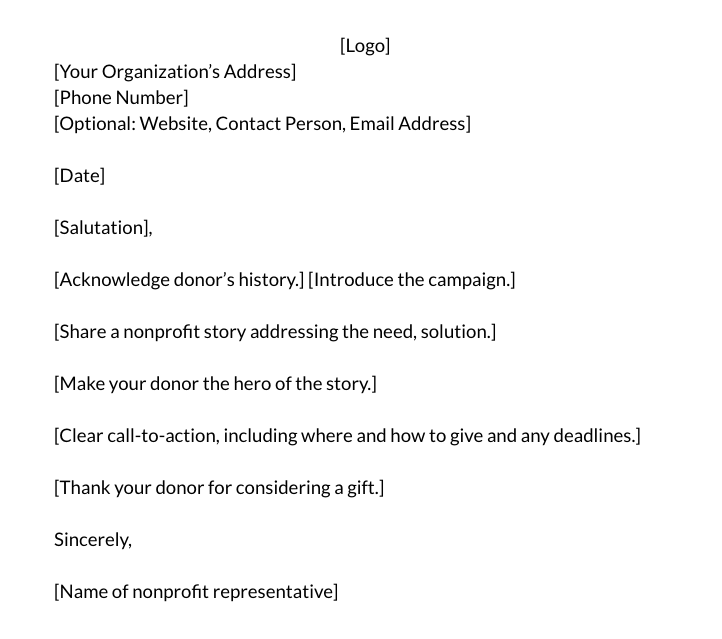 Once you write a solid donation letter template, you can build on it for campaigns and years to come. There’s no time like the present to perfect your donation letter and stand out amongst the crowd. You’ve got this! Thank you for sharing your recommendations. They are very useful:) You are right, now is a great time to collect donations. It is very important to write the right letters and work on good templates, so as not to waste time in vain. Collecting donations via email is not an easy task. We are a team of writers https://coolessay.net also developed templates that work. Here are a few things to remember to make your writing more effective. Be polite and concise. It is important to politely submit all the importance of your information and not to do it in 1000 words. Your reader may not have time to read all the information.